Sea, Sand & Sky: A Nine Eyed Giant Prehistoric Sea Spider in Quincy! A Nine Eyed Giant Prehistoric Sea Spider in Quincy! That's right folks, my buddy Sully from Quincy caught one of those creatures I describe above in the title, right in Blacks Creek. 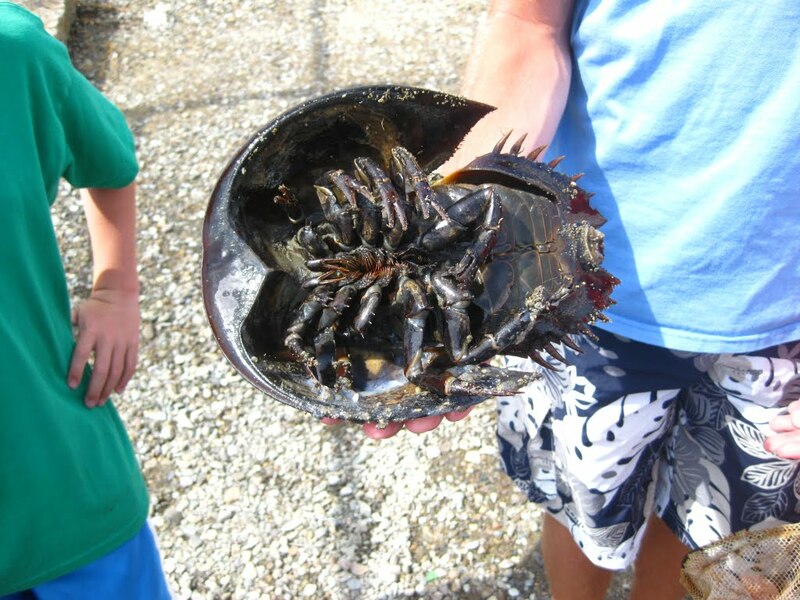 Well, I should clarify, he actually caught a Limulus Polyphemus or as it is more widely known, a horseshoe crab. It is true though that the Limulus Polhemus species is millions of years old; they were alive even before dinosaurs roamed the Earth. When he hauled this ancient relic to shore, many kids mistook it for a crab. However, Limulus Polhemus is more closely related to spiders and scorpions. Each camper got a chance to hold the animal and flip it over so that they could see the underside of Limulus Polhemus. We could spot the gills, the head, and the six legs. What we did not spot however was the nine "eyes" that the Limulus Polyphemus has. I later read that these eyes are compound eyes, much like that of a fruit fly, with two on each side of the head, five on the carapace (shell), and two in front of the mouth. This really was a bizarre and fascinating creature, one I'm sure the campers enjoyed.